Today is the 137th Annual Kentucky Derby at Churchill Downs. 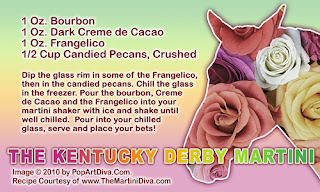 This Kentucky Derby Martini is a nutty chocolate and bourbon cocktail inspired by a famous Derby food - read more about the creation here. There was another horse called Pants on Fire whose name I liked too and his colors are also pink but his odds were even lower at 20-1 so my money went on Midnight Interlude. There are now only 19 horses running the race this year (at the time of this post) as Uncle Mo scratched on Friday. The post time for this year's "Run for the Roses*" is 6:24 p.m. EDT (time subject to change) and if you're not there live you can watch it on NBC - so, get your Kentucky Derby Martinis in hand, place your bets and enjoy the race! *Why is the Kentucky Derby also referred to as the "Run for the Roses"? Because the winner of the race is covered with a blanket of 554 red roses. GO MIDNIGHT INTERLUDE - MOVE YER BLOOMIN' ARSE!